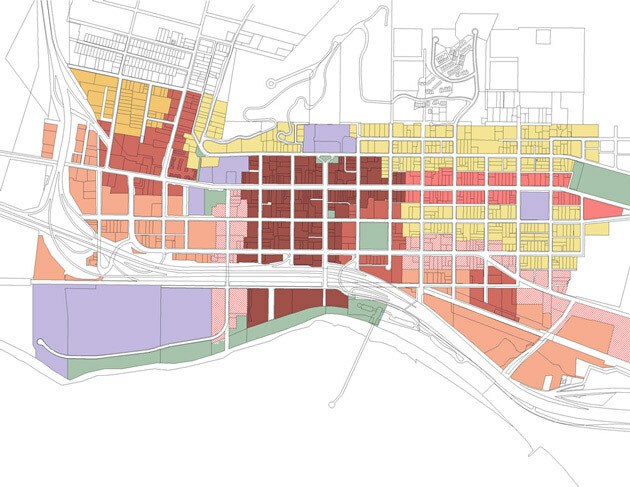 The Ventura Downtown Code, adopted in 2007, is one of the first Form-Based Zoning Codes in California—the result of an extensive and detailed analysis of downtown Ventura’s existing streets, blocks, buildings, public open spaces and landscape. The Code is divided into four primary sections and provides a framework for expanding, enhancing and protecting Ventura’s rich urban and architectural heritage. The Development Code stipulates the setbacks, height and parking requirements of proposed buildings, while architectural types describes their form, size, use and disposition. Frontage types explain the treatment of street-facing facades: front porches, stoops, arcades or storefronts. The blended-type development section insures that large land parcels are developed according to the scale and character of Ventura’s existing urban fabric through the introduction of streets, alleys and a variety of buildings types. “The new Downtown Specific Plan and its implementing Form-Based Code have not only won planning awards, but at least two of the early projects completed under the new code have been award-winners as well. Developers report a far more straightforward process and standard for entitlements and community interests have embraced the vision and action steps that we’ve pursued since its adoption. It is widely recognized and appreciated for not only guiding new physical development, but also shaping a comprehensive ongoing effort to improve safety, security, prosperity and our historic heritage. Downtown’s remarkable strength in weathering the recession is due in great part to the blueprint unanimously adopted by the Council in 2005,” said City Manager Rick Cole. In collaboration with Crawford, Multari & Clark Associates and Sargent Town Planning.